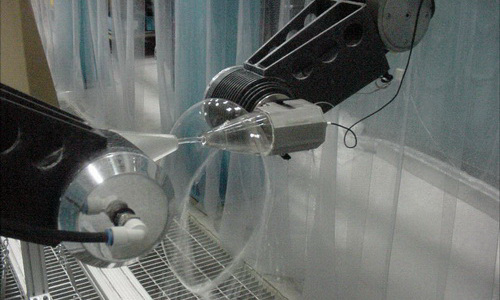 Resource Engineering, Inc. (REI) was incorporated in 1993, with the purpose of designing and building precision positioning systems to be used in several applications across a multitude of industries. 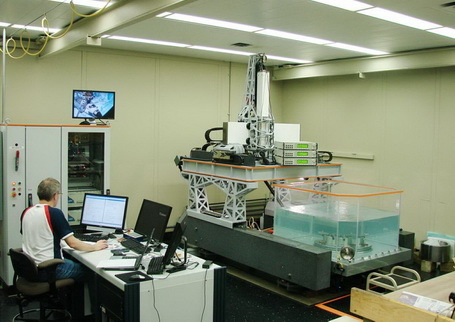 The core group of personnel representing REI bring over 60 years of experience in the engineering, manufacturing, assembly, testing, installation and sustaining of precision multi-axis (10 Axes+) positioning systems used in the Metrology and Non-Destructive Testing (NDT) industries. This extensive experience has culminated in the development of the most advanced Ultrasonic Scanning Systems and Coordinate Measuring Machines (CMMs). 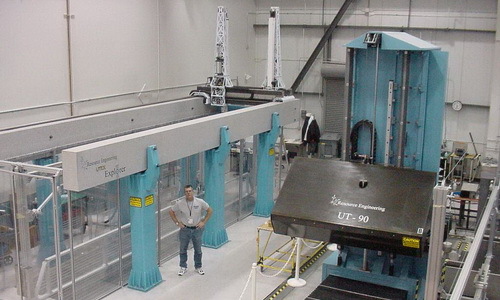 The extensive use of composite materials in manufacturing of aerospace structural and engine components dictates a need for high perofmance/high throughput UT Inspection Systems. 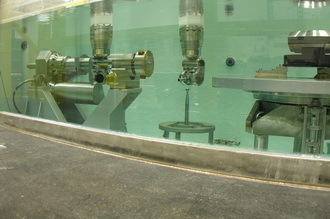 Composite parts can be scanned using various configurations of Immersion and Non-Immersion ("Squirter") systems, in both pulse-echo and thru-transmission modes. REI offers all possible scanning configurations, including overhead gantry, travelling bridges, dual scanning towers and flat bed scanners. REI Scanners are designed to inspect a wide range of aerospace componentss, from flat panels to complex/contoured parts to continuous rotating parts (Horizontal or Vertical Axes). Resource Engineering's family of Traveling Bridge, Gantry and Horizontal Arm CMMs, with extended travels, provides unequalled performance in speed, accuracy and repeatability. 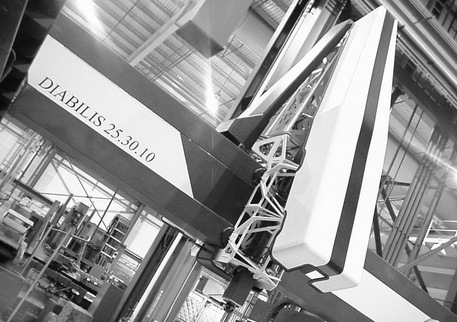 REI believes in only using the best possible materials in the production of multi-axis positioning systems. The use of Alumina Ceramic for the crossbeams and spindles is standard on all of our CMMs. For the Horizontal Arm configuration UltaHigh Modulus Carbon Fiber is the preferred material for the cantileverd spindle. 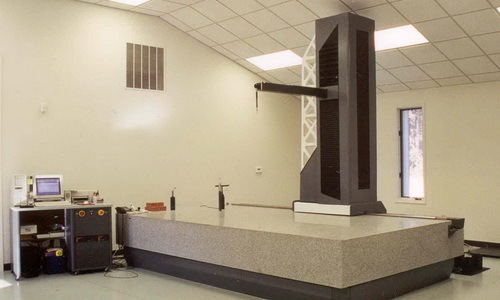 Through our Patented CARBINVAR technology, REI has produced crossbeams and bridge structures from INVAR36 and Carbon Fiber to produce an entire metrology frame that is thermally Inert. 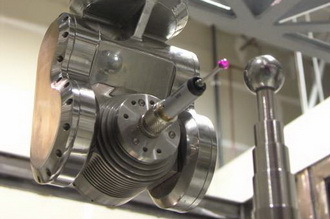 Resource Engineering provides a full range of in-house services including mechanical and electronic design, machining and fabrication, instrumentation and motion control. This allows us to provide a seamless, fully integrated solution, and provides a single point of contact for our customers. To compliment Resource Engineering's advanced mechanical positioning systems, REI has teamed with the best in their respective industries: for multi-axis Motion Control Hardware/Software - Aerotech, Inc.; for UT Data Acquisition/Analysis - UTEX Scientific, Inc.; and, for Metrology Probing Systems, Controllers and Software- Renishaw, Inc.. With these strategic partnerships Resource Engineering has positioned itself to provide the ultimate solution for your company's Non-Destructive Testing or Metrology requirements. ©Copyright 2015 • All Rights Reserved • Resource Engineering, Inc.